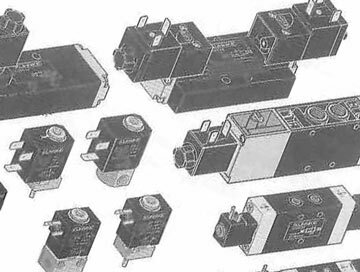 Pneumatic valves are just one type pneumatic control that we sell. There are many different types of valves for different systems; however, they are all designed to control rate, pressure, and amount of air that goes in and out of a pneumatic system. These valves are vital for the proper functioning of the system. This is because the system works when compressed air is forced into the machine to create power. Consider certain pneumatic pressure power tools, such as an air drill, air belt sander, air caulk gun, and air impact wrenches. You need to consider the different functions and components of the pneumatic system, so that you can best determine which sort of valve would be best. Depending on the job and machine, a specific valve can work better than others. Do you need a valve that can change directions? Does your valve need to stop flow all together? If you are uncertain of the valve you need then give us a call. Our trained staff can talk with you about your systems and what you are looking to do, so that you can get the best pneumatic products. When you call us you do not speak to a sales representative. Instead, you speak with someone who is going to talk to you about solutions. There are different choices you have when it comes directional control. Simply put, most are distinguished by the actual number of ports they have. 2-way directional valve: as you can gather from the name, this valve moves airflow in two separate directions. Both ports have the ability to be opened or closed depending on what you need done. 3-way valve: each of the ports on this valve serves a specific function (unlike like the 2-way). The first port is for airflow intake, the second is for an exhaust, and lastly there is the port to connect two deceives. 4-way: These are probably the most commonly used type of valve. Two of the ports attach to actuators, while one is for airflow, and the other for exhaust. This valve is common because the 4 ports allow for motion of a motor or basic cylinder to be easily reversed. There are many different options for different valves, including spring offset and resting state (open or closed). We store a large variety of different valves, so that we can ship quickly. If you know what you need give us a call, and we will get you your product quickly. If you don't know what you need give us a call and let's have a conversation. We know pneumatic controls.